Sainted John, Metropolitan of Tobol'sk and All Siberia, the Wonderwonder, in the world was named Ioann Maksimovich, and he was born in the city of Nezhino in 1651. His father Maksim Vasil'evich and mother Evphrosynia had a total of seven sons, of which John was the eldest. Upon his completion of the Kievo-Mogilyansk College (afterwards transformed into the Kiev Spiritual Academy), the future hierarch emerged from it as a teacher of the Latin language. Thereafter, in 1680, he accepted monasticism at the Kievo-Pechersk monastery and became absorbed in the deed of inner activity. With the general consent of the brethren, the young monk was entrusted the responsible obedience of preaching. From this period of time there was revealed in him an exceptional talent of eloquence and graced abilities. He attached an especial significance to inward religious self-knowledge. The chief theme of his life can be defined at a stroke as: "How ought man to conform his will with the will of God?" He developed this theme both in his preachings, and in his subsequent missionary service. In answer to it appeared the work, published towards the end of his long ascetic life, and entitled: "Iliotropion " (the "Heliotropion" or "Sun-Flower" – a sun-turning plant), or the Conforming of the Human Will with the Divine Will". Of the great many works from the holy fathers of the Orthodox Church, this work gives most fully an answer to this great question of Christian soteriology. In 1658 they dispatched him on a mission to Moscow. There he was appointed by Patriarch Joakim (1674-1690) as vicar of the Bryansk Svensk monastery, which was then under the Kievo-Pechersk Lavra. On 10 January 1697 the Patriarch of Moscow and All Rus Adrian (1690-1700) with a sobor of bishops ordained Archimandrite John as Bishop of Chernigov, in the great Uspensky-Dormition cathedral of the Moscow Kremlin. Upon entering into the guidance of the diocese, Bishop John created nearby the archbishop's cathedral a Collegium, similar to the Kiev Academy, which the saint intended should serve as an "Athens at Chernigov" – a school of pious enlightenment. In view of its high level of theological education and training, the school of Saint John received wide reknown. And in essence, this was the first seminary in Russia, on the model of which there began opening spiritual seminaries in other dioceses of the Russian Church. The saint also later opened a printing press, at which he and his successors published many works of spiritual-moral content. The life of Saint John was illumined by lofty virtues, and especially humility. It is reflected also in his works: "The Moral -Didactic Reflector" (Chernigov, 1703 and 1707); "The Alphabet, with Rhymes Added" (1705); "The Virgin Mother of God" (1707); "The Theatron-Theatre, or Moral-Didactic Disgrace" (1708); "Excursus on Psalm 50" (Chernigov, 1708); "Excursus on the "Our Father" and "The Eight Gospel Beatitudes" (1709); "The Royal Way of the Cross" (Chernigov, 1709); "Thoughts on God to the Benefit of Right-Belief" (1710 and 1711); "Synaxarion Commemoration on the Victory of Poltava" (1710); "The Pilgrim" (in manuscript); "Spiritual Thoughts" (Moscow, 1782). At Chernigov in 1714 the saint also first published his chief work, written in the Latin language. (A peculiarity of the graduates of the Kiev school was this, – that they wrote their works in classical Latin. Professor I. A. Maksimovich in 1888 translated the "Iliotropion" into the modern Russian language and published it at first in parts in the "Chernigov Diocesan Newsletter", and later on in a separate book – Kiev, 1896). With his name is connected also "The Latin-Greek-Russian Lexicon". Saint John was known to have connections with Holy Mount Athos. He had an especially warm interest in the fate of Russian inhabitants on the Holy Mountain, and rendered them substantial material aid during these difficult years. His archbishopal grammota-document to the Russian Panteleimonov monastery has been preserved, and it testifies to his concern for those on Holy Mount Athos. On 14 August 1711, after his elevation to the dignity of metropolitan, Saint John arrived at the cathedra-seat of Tobol'sk and All Siberia. The saint concerned himself constantly with the enlightening of his diocese. And there also he continued with his work, started at Chernigov: he improved the school, which had been opened by his predecessor, the reknown missionary metropolitan Philothei (Leschinsky, + 1727), and he continued the apostolic preaching among the pagans of Siberia, converting many thousands to Christ. In 1714 Saint John set off to Peking in heading a mission with archimandrite Ilarion (Lezhaisky). At Tobol'sk he again undertook publishing activity, using the printing press set up by him at Chernigov. To this time period belongs also the publishing by Metropolitan John of the "Iliotropion" in the Slavonic-Russian language (1714), so that the Siberians likewise should understand it. 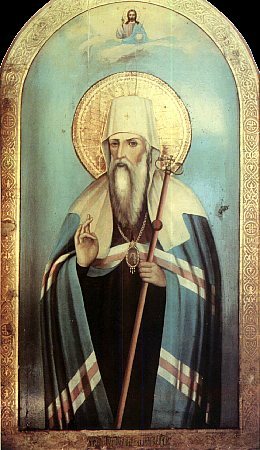 About the life of the saint in Siberia the chronicler reports: "He was quiet and unpretentious, graciously considerate, sympathetic to the poor, and merciful". He often helped people. Secretly, and sometimes in the garb of a simple monk, he would bring to the home of the needy generous alms with the words: "Accept this in the Name of Jesus Christ". His home at Tobol'sk was always open for all those in need of help or word of comfort. Even on the day he died, 10 June 1715, after Divine Liturgy – as was his custom even earlier, Saint John had set up at his home a dining-hall for the clergy and the impoverished, and he himself served at table. Later on, having taken his leave of everyone, the saint withdrew to his chambers and at the time of the church-bells for Vespers he died at prayer, on his knees. The saint was buried in the chapel of Saint John Chrysostom at the Tobol'sk Uspenie-Sophia cathedral. Saint John has long been venerated in Siberia. In light of numerous miracles and the longstanding local veneration of the memory of Saint John, in the year 1916 the Church established the all-Russian celebration for the day of repose of the saint to God – 10 June. The memory of Saint John is fervently kept by Siberians and by all the believing Russian people. He at present rests in the Tobol'sk cathedral of the Pokrov-Protection of the Mother of God. The service to him was republished, with the blessing of His Holiness Patriarch Alexei, by metropolitan Vartholomei (Gorodtsov) in 1947 at the city of Novosibirsk.